Because I don't have time. Very nice wallpaper.Add to fav. Nice BG and Suigintou very match for each another. But It's a bit too dark. But nice ^ ^"
I love Suigintou - fan. Nice for wallpaper her. oh wow! this looks really great! and the wallpaper itself is just wonderful..
i like the light effects and the dark background..
you have created a nice atmosphere here. 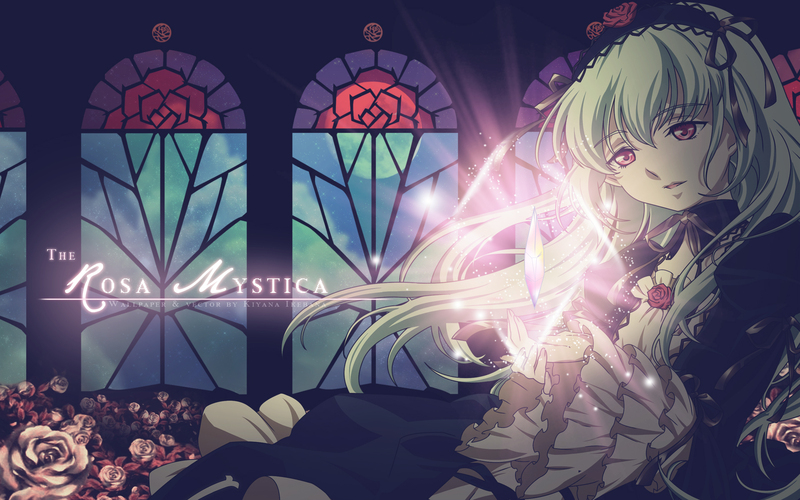 coool!rozen maiden!your vectoring is really good! i can't wait for your other vectors!thank you very much for these awesome work! This is amazing, I love the vector and the background! Though, I have to say the font is jaggy and the roses in the lower left corner are a bit blurry, but it's not that important. Keep up the great work! +fave from me! Would perfect if you had vector the roses. But finally, continue the good work! YEAH^^Rozen Maiden forever^^i love her! thanx for the share! This is great. The Gothic indoor rose garden, and all the rose motif. You can still tell that the effect around the Rosa Mystica wasn't original - it's probably the shadow isn't done right, and ithe effect is in a CG style different from the handdrawn feel of the rest - but you do get a real effulgence in return.